ST. GEORGE – A proposed water park set for the Middleton suburb of St. George is moving ahead thanks to the City Council voting to abandon a segment of roadway to the project’s developers Thursday night. 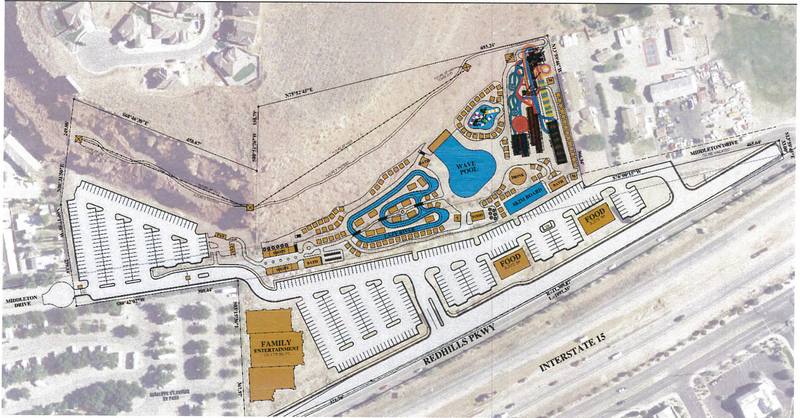 The “Splash City Adventure Water Park” is slated to be built in the area of 2200 E. Middleton Drive across approximately 10 acres just west of Interstate 15 and next to the city’s border with Washington City. The segment of road being vacated will be absorbed into the water park property as the project moves ahead. While they gain a portion of Middleton Drive, developers will also build a road between Middleton Drive connecting to Red Hills Parkway in the area of Highland Drive in order to preserve traffic access. Developers will also widen Red Hills Parkway along the front of the water park to five lanes with two entry points into the parking lot from the frontage road. Developers are required by the city to build the new roadway between Middleton Drive and Red Hills Parkway before beginning construction on the water park proper. The eastern end of Middleton Drive that connects with Red Hills Parkway is being left alone so a business and neighboring residences can maintain access to Red Hills Parkway, said Shayne Barney, who represented the developers at the council meeting. He also said the roadway would not be used as a general access point into the water park. About a dozen residents voiced their concerns to the City Council with a majority of comments dealing with traffic and parking worries. Increased traffic through Middleton neighborhoods and parking in front of homes was mentioned among those concerns. One resident said he would have any cars parked in front of his home towed if it got to that point. At least two area residents suggested a traffic signal be provided at an intersection so drivers could safely make turns onto Red Hills Parkway. Abandoning the road would “impact our business significantly,” said Dorothy Huntington, one of the owners of Somerville Automotive and Marine, a business that sits next to the Middleton Drive-Red Hills Parkway intersection. The intersection is already a mess without the added complication of vacating the road, she said. Huntington added that she’s seen the traffic on Red Hills Parkway get backed up from the Green Springs intersection on occasion. At times like that, access to her business will be cut off, she said. “That’s a no man’s land and that intersection is terrible,” City Manager Gary Esplin said. While the city vacated a segment of Middleton Drive to the Splash City developers, it retains ownership of the so-called “terrible” intersection. Esplin said the city may want to consider finding the funds necessary to fix the intersection somehow so it’s less of a nightmare. While the primary opinion of area residents was that abandoning the roadway would make matters worse, members of the City Council said they believed it could actually improve the area and make it safer. The City Council also approved other measures related to the water park, such as the height of 80 feet for a water slide tower and a site-design plan. The water park will have a tropical island theme and feature water slides, a 900-foot-long “Lazy River,” a surfing-capable wave pool and play areas for children, all surrounded by shaded cabañas. While the water features are planned to be open on a seasonal basis, there are also plans to construct a 22,179-square-foot “family entertainment center” – including a large arcade room, trampoline area and indoor surf machines – to be open year-round. 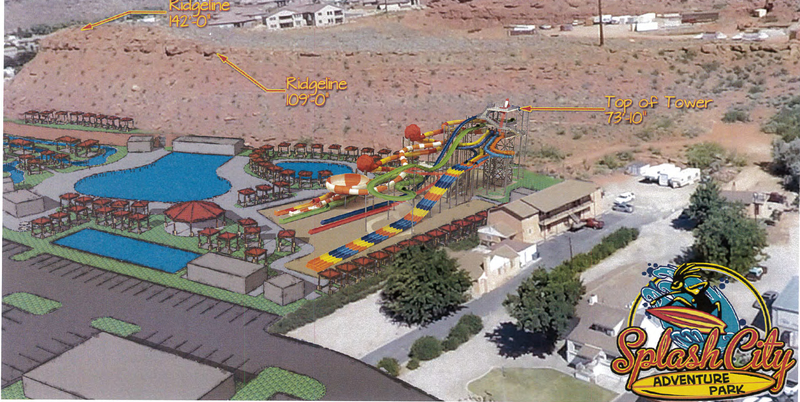 Attempts have been made in the past to build a water park in St. George, yet none have gotten this far. A preliminary concept was presented to the City Council in October 2014 for a 13-acre water park behind the Dixie Center where hotels now stand. If timing and future council-needed approvals for the water park go well, Barney said, developers are hoping to open the Splash City Adventure Water Park by summer next year. “Attempts have been made in the past to build a water park in St. George, yet none have gotten this far.” These are the same developers as the previous attempts. I give this about a 0% chance of happening. What a stupid location!! I’m all for a water park, but it’s know wonder it fails in every attempt of development. For pete sake Council members please approve it on some land that is accessible and non congesting. Off of exit 13 would be far better. I agree with Matt that if it doesn’t have 0% chance it should. They likely wont build it unless they get a massive multi-million $ city subsidy from us ‘joe taxpayer’. That’s usually how it works. And some kind of guarantee that the city will handle all liability insurance issues. Liability has put many a waterpark out of business. All it takes is 1 serious injury. I thought all of Washington County has a serious water shortage. Isn’t that why there is a proposal to build a pipeline? Does St George have so much water that they want to build this? Perhaps adjoining towns need to build a pipeline to St George. Poor choice of location and not a penny of taxpayer money or liability exposure should be the primary consideration for city officials. That said the area should support a private water park with all the tourist passing though. The developer might want to include a first class miniature golf course as well. These waterparks sound better on paper , arrive with a big splash , and then result in a big dud! I want it very clear from the get go that if the close down they will demolish and remove the eyesore within an allotted time period. The people most for this waterpark are the people that are enamored with the idea that they have found a new cheap alternative to a babysitter. The reality of a water park sets in very quick, this is a disaster all around. Bad idea. We will all pay for this in the worst way; higher water bills in an area that does not have water to spare and a tax increase. If this is built both will happen and it won’t be cheap. Agreed. Very poor location, and this business will not get a dime from me. As a resident of Saint George, l think this water park would be such a great idea. We have so many younger families that have no where to take their kids for fun. We need something like this so we don’t have to travel far to find something fun for our kids. I love the location and think it’ll be great for families. My kids are very excited. But not all that patient; I hope it’s done soon.